In the first part of this series, I discussed how the curve of Total Revenue vs Price is simple – low at both extremes with a single bump in the middle. In the second, I summarized qualitative wisdom about what that optimum value might be. This post reports what quantitative data I could find on the internet. The data is meager. I found only two sources: Bookbub and Smashwords. As many know, Bookbub is a promotion site for eBooks. For a fee, limited time bargains are email blasted to a very large list of subscribers (millions of them for certain genres). It cost a fee to have your book selected for a blast, and merely be willing to pay is not sufficient. The Bookbub curators choose the books that they judge to have high quality. The email subscribers know this and appreciate being able to peruse a better subset of books out of the tidal wave of selections available. I am not going to address the pros and cons of Bookbub here, only the pricing data that they have put online. At https://insights.bookbub.com/top-ebook-price-promotion-stats-you-need-to-know/ one can see the following bar graph. These data are an example of what I had been looking far. It gives the curve (well, three points on the curve) of number of sales as a function of price. As discussed in part one of this series, once you have this information, you easily can calculate the total revenue as a function of price. And from that see which price provides the greatest total revenue. There is a statement on the Bookbub webpage text that sales for $0.99 are at least 75% more than those for $2.99. For the purposes of this post, I have disregarded the ‘at least’ and used 175 for the 0.99 data point (for when the 2.99 data point is 100). Nothing is said about the 1.99 price so I used a ruler on a screen shot to estimate that, if the 2.99 sales were 100, the 1.99 would be 120. I have calculated the Bookbub total revenue in the format I used for the first post, Here it is. For comparison, I also have copied the hypothetical example results here. Not too shabby. The Bookbub data starts off low and rises as prices increase as expected. The graph mimics the lower portion of the hypothetical curve. Unfortunately with only three points, so we cannot see the peak in the middle with any certainty. The optimum value actually may be 2.99, but it also could be even higher. And at least one can get the warm feeling in the tummy that we are on the right track with the part one logic. Caution! 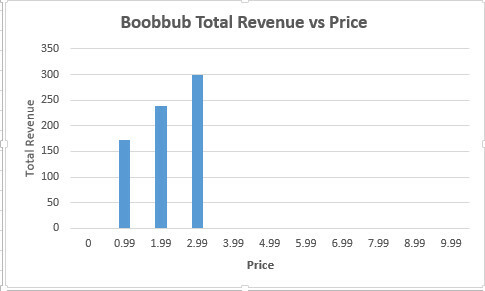 One cannot use the graph as shown above to make a profit decision for using Bookbub. The profit is the net revenue minus the fee you have to pay. This fee also depends on the price, and the higher the price, the greater it is. If the fees were included in the calculations, the price for the optimum profit easily could shift from that for optimum revenue. The graph of number of sales as a function of price is on the left above. The total revenue on the right. Let’s first examine the curve on the right. Disregarding 9.99 for the moment, it looks like 4.99 is the optimum price. And, who knows, if Bookbub ran promotions up to 4.99 and beyond, their results might agree. But there is a problem. Look at the graph on the left. In the real world, well, for the Smashwords world anyway, the number of books sold verses price does not decrease monotonically as price is increasing — the assumption used for the hypothetical result in part one of this series. 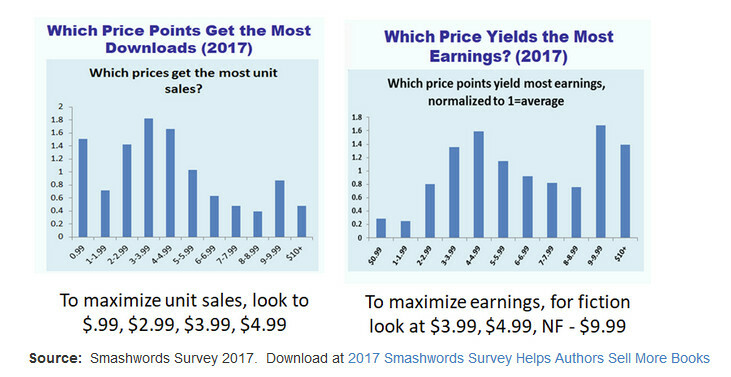 For Smashwords, the data points from 3.99 to 8.99 behave as expected, but sales for 3.99 is greater than that for 0.99, 1.99, or 2.99! Perhaps this is due to the fact that books at those lower price points are more likely sold by Amazon and not Smashwords, but who knows? And then there is another anomaly at the higher values – spikes at 9.99 and 10.99! Where do those come from? The results show that 9.99 gives the best results of all! The Smashwords text says that they might be due to bestselling authors who know the demand is high can take advantage of that in the marketplace. This last comment suggests that maybe too much data has been conglomerated together. Maybe the Bookbub sales detract from those sold on Smashwords at low prices. Maybe the non-fiction books are what is pushing up the sales at 9.99 and 10.99. One could say that, based on both datasets, 4.99 looks like an attractive candidate for the optimum price, but with no other sources of data, we can’t validate the conclusion. We can’t be sure. Well, there is hope. There is one source available to each of us – our own book or books. Data on your own sales provide a sample not distorted by whatever is happening with other authors. Amazon makes it quite easy to change book prices at any time. One could run a series of experiments that are exactly tailored to your own situation. There would be no contamination. Pick a book and systematically change its price say, once every month. Collect the statistics and keep track of the results. Compute the total revenue for each of your price points. When you find the best price, choose it as the one to use going forward. You can go back to sleeping better at night. There are a few caveats of course. If you publish eBooks on both Amazon and Smashwords, you probably should confine the price change experiments to Amazon only – and always have them lower than their Smashwords counterparts. Otherwise, you might find that Amazon as automatically reduced your prices to match the competition, and you have no way to change them back quickly later. Secondly, you do have to be selling enough so that the sales volumes you get are larger than the random fluctuations that will happen. Other than that. Happy price optomizing! In the preceding post,What is the best price for an Ebook –Part 1, I talked about the underlying economics that affect book pricing. It all boiled down to the fact that if you know the number of your books sold as a function of price, you could determine the price that maximized your book sale income. In this post, I briefly summarize some of the conventional qualitative wisdom that I found from surfing the internet. There is so much competition out there that the potential readers have little chance of learning that yours even exist. By making the first book free, these readers can take a chance on you without any risk. 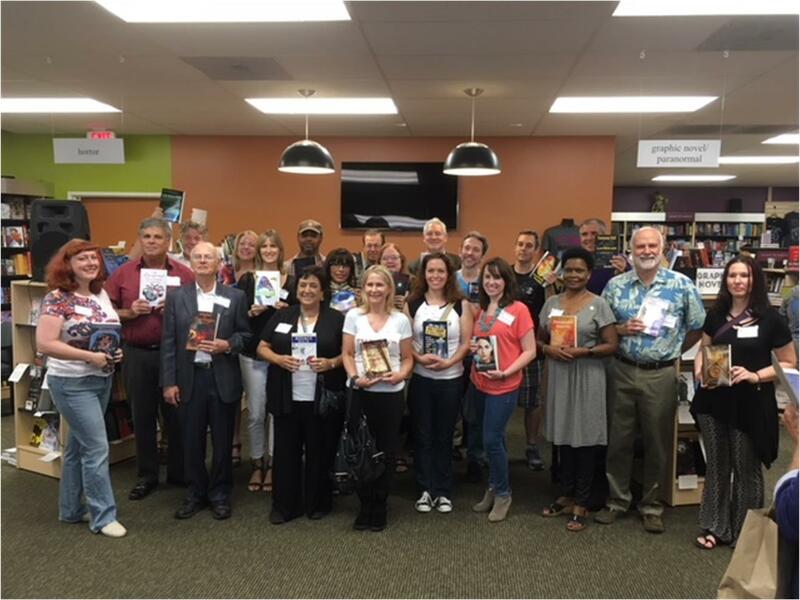 Free books build awareness and a readership following. Then, if what you have written is well liked, readers are primed to snap up your second book when it comes out. You will more than recoup the lost revenue by stronger sales of future volumes. 2. Don’t make your book free. The people who buy free books don’t pay money for any books that cost anything. Why should they? There are always more free ones to choose from. Most people who download eBooks never get around to reading them anyway. They are too busy downloading more free books. This audience is unaddressable. Don’t waste time on them. Consider your first book a permanent loss leader. Or, from time to time run promotions in conjunction with sites that publicize limited time sales. People like bargains. It doesn’t matter much what they are. They just like bargains. Low price denotes poor quality. Readers know this and they will shy away from books that are too inexpensive. You are building a brand with your series of books. Establish brand consistency. The reader can count on each volume having the same bang per buck, the same quality. 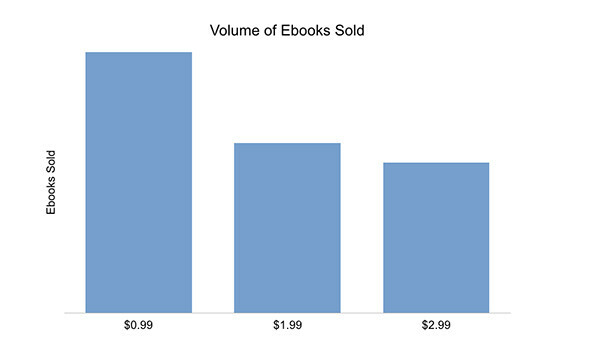 Otherwise the reader will wonder why one volume costs more (or less) than others. It eats away at the trust that you want to have with him. 6. If you have a series of books, price them differently. There is no definitive way to know what the optimum price is for any individual author. Give the marketplace choices, see what happens with different volumes having different prices and then select the best choice to use with them all. So, the answer is …??? My surfing did not help in my quest as much as I had hoped. All of the qualitative arguments I summarized each carry some measure of truth with them, but for each suggestion a counter argument can be found. One thing I did learn, however, is that considering pricing in a vacuum for each book might be a mistake. The best price of one can influence the best prices of others. So, I have modified my original question. Now it is the following. What is the best price for a book if it is not the very first one. In my searching I did find two sites that had some quantitative data. I will report on them in Part 3 of this series. But what about the authors? We, too, want our works to be as perfect as they can. No flaws. No typos, no bad grammar, no prose too dense to wade through. With the advent of the EBook and sites like Amazon and others, “now” is also pretty much realized as well. But the price? Ah, that is more complicated. Sure, we all want what we write to reach the greatest possible audience and to bask in the attention that we get as a result – the satisfaction of our stories being read. But there also is the little matter of putting food on the table. To be frank, most of us want to earn as much as we possibly can from our efforts at writing. But at what price? There is little disagreement that, if we offer an EBook at no cost, the number of readers we reach is as large as it possibly can be. An idealized graph of the number ‘sold’ as a function of price looks somewhat like the following. It is the highest for zero cost and continually decreases for each increment in price thereafter. On the other hand, the more we charge per sale, the more revenue is earned with each book sold. 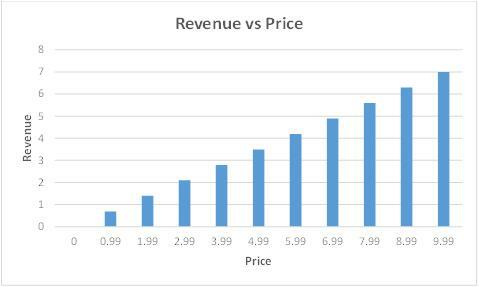 The curve of revenue as a function of price is a no brainer. It looks like this — a straight line rising to the right. It can be calculated with certainty. For a vendor such as Amazon or Smashwords, the royalty rate is around 70% for a single book. One selling at $5.00 generates around $3.50 of income. The graph for the total money earned is simply the product of these two curves – the number of books sold times the revenue earned per sale. Even without knowing the exact details of the total revenue verses price curve, we can estimate what it has to look like. For low prices, the total revenue is relatively low. It has to be. The low price for each book sold drags down the total money earned. Likewise, for high prices, the number of sales is also low. The high price suppresses the number of books sold. Okay, we have a curve that is low at both extremes. What else can we intuit? Well, the two curves that form the basis for the third do not have a lot of bumps and wiggles. This means that neither can their product. So, the revenue earned curve rises from a relatively low value on the left, reaches a peak, and then declines to the right. A single bump in the middle is the most it could have. 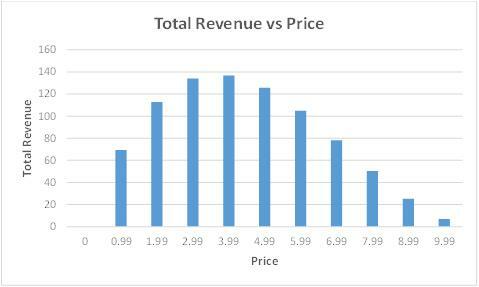 The price that generates the most revenue lies somewhere between the two extremes at either end. In real life there are many factors involved that determine the sales verses price curve. This means that the revenue verses price curve is not a single one that applies to all genres and authors – or to even all books by a single writer. But if we had an honest to goodness, real numbers for the sales verses price curve, we could then compute what the total revenue per price curve looks like, just like we did for the example. 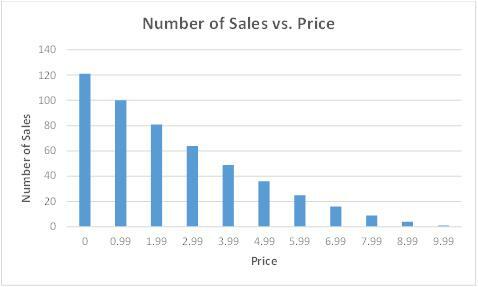 The problem is: what does a real number of sales verses price curve look like? Over the last year or so, I have scoured the internet looking for quantitative data that might help pin down more precisely the numbers that make up that curve. Is there an abundance of quantitative data our there for that? Ha, I wish! My starting point was to look at qualitative advice offered on Goodreads and go on to other internet sources from there. Part 2 of this series of blog summarize what I found. Please stay tuned. There has been a lot of publicity about the recent eclipse. This post records my personal experiences. The preamble is quite long, but for me, very much part of the adventure. My wife, Joan, has a cousin who participates in a multi-site timeshare program. A dozen or so of the extended family decided that we would gather at the venue in Bend, Oregon and travel by car from there the forty or so miles north on US 97 to the little town of Madras to view the eclipse. It was almost dead center on the line of maximum totality. In February, Joan, and I made our airplane and car rental reservations for the big event. Unfortunately, an estimated 100,000 people also had the same idea. As the date approached, postings on the internet became more and more bothersome. It would take 10 hours to travel from Bend to Madras. To ensure that one got to the little town in time, depart by 10 PM the night before. A total stoppage due to breakdowns was a distinct possibility. One may not even get to Madras in time. The National Guard would be maintaining order. Signs on the restroom facilities in Bend city parks proclaimed “Closed Because Of Eclipse”, and tens of portapotties stationed in their place. Citizens were to stock up a two weeks supply of food. On the Wednesday before the big event, the entire city ran out of gas. Prices began to soar. Renting one of the remaining cars rose to one hundred dollars a day. It was rumored that Motel Six was aptly named – six hundred dollars for a single night’s stay. So, it started to sound like the idea of simply bopping up to Madras might not be the best idea. Where else in the area could we go? Even though the band of totality was tens of miles across, the duration becomes less and less the farther you are from the centerline. In Madras, it is a little more than two minutes. A few miles south of Redmond – where the regional airport is – it is only a few seconds. Joan’s cousins purchased USGS maps and scoured them for alternatives. They weren’t many. Central Oregon is not densely populated. Few roads are there. They ended up selecting a place in the middle of what is called the National Grasslands – west of the route to Madras. By traveling on two lane country roads, some unpaved, we could get far enough north to have more than a minute of totality. A dry run was in order, and so a few days before we set out in a caravan. The early going was easy – uncrowded, no signs of a swelling influx of people. We came to our first unpaved road and it looked quite decent – smooth gravel and oiled. There was no civilization in sight – no houses, ranches, cattle, nothing, just the flora of high desert. As we traveled northward, the conditions of the road deteriorated. First, the oiled surface gave out. Then the gravel transitioned to larger rocks. We reached a sign that said the road was not maintained further north. We pressed on and the rocks became boulders. Navigating between them became tricky. Finally, (duh! ), we realized that we were in ATV terrain. Only a hint of a ‘road’ lay ahead. We consulted our maps. After retracing our steps to paved roads, we could go several miles west on State 126 to link up with another unpaved road heading even farther north. Rationalizing that we would be going in the opposite direction on 126 than the influx of watchers from the coast, we pressed onward. The second unpaved road was also oiled and we traveled along it until it ended at a gate to private property. Farmland on all sides. 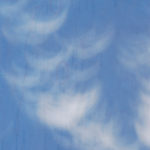 Except for a haze from uncontrolled forest fires in the area hugging the ground, the sky straight up shown blue and uncluttered. Maybe we had found a place that no one else would think of. However, one of the owners of the farms surrounding the road then appeared. He was not happy at all about our presence. Even though both sides of the road were fenced off and showing No Trespassing signs, we pointed out that the road itself was not marked private and therefore open to the public. There were bad vibes all around and we left, wondering what we would see when we returned on eclipse day. Would our route be congested by late comers? At the site, would we see farmers with pitchforks and dogs? Police cars blocking the road? We were not sure. Of course, the fleeting nature of the event made us all anxious. Only one shot at this. No return the next day to do things better. All it would take was a single wrong turn, slightly more cars than the roads could handle, and the chance would be over. They were quite friendly. Pointed out that they lived north of where we were standing, in an area near the Crooked River. Gave us their address and said we were welcome to come to their house to watch the eclipse. And, by the way, at the end of the street where they lived – as far north as you could go by car — was Panorama Park – a small public park with parking for about ten cars, restroom facilities, and even playground equipment for kiddies. We raced back to our cars and followed the directions given to us up to the park. It was perfect – just as described. This became Plan A. If the parking lot for the park were full when we got there then we would use Plan B – the address of the local. The National Grasslands relegated to Plan C.
So, on the day of the eclipse, a couple of the cousins left the Bend area at 3 AM. They traveled up US 97 and there was no traffic. The rush starting at 10 PM had not materialized or was already over. (In the aftermath, the conclusion was that there were only 60,000 in Madras, not over 100,000.) In an hour or so, our advanced party staked out three parking spaces with tables and chairs set out for the rest of us. Eight others left at 5:30 AM. We traveled the back roads as we had before. No traffic. When we arrived at the park, there were only three cars there. As the time passed, it gradually filled up, but never became over crowded. At shortly after 9 AM, we whipped out our eclipse glasses, settled back into our lawn chairs, and watched the progress. Totality was about an hour away, so it became a pleasant outing for all concerned. Check on the latest progress. Yes, by golly, the bite out of the sun was getting bigger. Then walk around a bit and chat with the others who had come. A bonding that we as humans do when we are having a shared experience. A few people used index cards to make pinhole cameras with index cards to view what was happening without using the glasses. Even neater was to examine the trees scattered in the park. As the sunlight filtered through the leaves, many pin hole cameras were formed. Place a large piece of cardboard near the ground and you could see scads of partial eclipses shining through. As the transit of the moon continued, we could feel it gradually getting colder – not much maybe twenty degrees at the most but nevertheless one of the subtle clues about what was happening. Finally, the big event itself. Though our glasses we could see that only a thin crescent remained of the sun – even though the sky around us was not significantly diminished from what it was before the eclipse started. The power of the sun was so great that having most of its rays blocked made no difference. The last sliver began to grow shorter at both ends finally just a single dot at the edge of the moon. As the last dot vanished, I whipped off my glasses and saw the diamond ring, a brilliant burst of sunlight on the edge of the black disk caused by the last of the sun’s rays coming through a valley between two lunar craters. 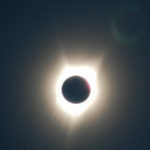 For me, seeing a total eclipse was quite different from watching a partial one. A partial eclipse is an intellectual experience; a total one is emotional. I felt as if I were a primitive homonid, looking up startled at the sudden loss of sunlight to see a sight never witnessed before. The sun was gone. In its place was a black disk surrounded by the wispy corona. What an impact that was! After years of getting up each and every morning of my life, no longer reflecting at all the usual events of the day – dawn, midday, and dusk. All taken for granted. Samo, samo. Now this! It hammered home a truth long forgotten. How insignificant is humankind in the glory of the cosmos. Angus, the exile, reached behind his head and smoothed down his long, flowing hair. It would reach his waist soon and he would have to have it sheared. A daily ritual of shaving kept his face bare. Black eyes like machined spheres of hematite marked him as cunning to the other Heretics; one to be dealt with only when necessary and then with caution. Only the tips of his fangs showed when his mouth was closed. Nor did his tunic cover his arms as it did most of the others. Rather, he bared them proudly, the thick fur as sufficient as sleeves. When he stood to full height rather than slumped, he was as tall as the natives roaming freely above. He ran his fingers over the polished wood grain of the orange-brown table, but its beauty gave him little satisfaction. Neither did the expanse of the rocky alcove about him, though it was larger than all but two others. More than three times his height, its smooth walls rippled like waves on a placid sea, a wrinkled bubble of air far beneath the ocean’s surface. Small flakes of gold shimmered in a narrow vein snaking above Angus’ head. Flickering candles standing in indentations chiseled into the walls gave only enough light so that the objects on the tabletop could be seen, but the rest of the alcove was in shadow. The wax was too precious to waste on reminding one of the crushing reality of confinement. Untold hours had been spent by the Heretics chipping away at the alcove floor to create the flat space on which the table stood and a pathway to a small oval opening leading to more caverns and twisty passageways beyond. Caverns and passageways—the entire world of the vanquished, the exiles, the Heretics Who Proclaim the Truth. Angus looked at the small clock on the tabletop, its pendulum swinging back and forth in frantic haste, far faster than the glacial slowness the humans used to mark their time. The humans. The puny, primitive humans. If they knew of his true status and that of the others of his kind, they would be laughing. He was a powerful alchemist. His brothers were potent practitioners of the crafts as well. Unfettered, subjugations of the surface dwellers would be easy. Yet despite this power, they hopelessly were confined in underground caverns. And so fearful that any use of the magics would alert the so-called Faithful, the oppressors who put them here, his brothers insisted no craft be practiced at all. The Faithful. Faithful to what? What an ill-fitting label. Sheep that move from one fad to the next with only the slightest prodding. The merest hint that something new was going to be more popular than what had come before. The idiots did not think, did not consider, did not engage with exercises of the mind. But then, it was no better here. Dinton, his eldest brother, how could he be so stubborn, so unseeing, so afraid? Whenever he had possession of the baton, the depression of the flock members always increased. There was always the risk one or more would remove their rings and surrender—unable to accept who knows how much longer—more centuries encased in rock before they might possibly be free. Dinton and Thaling would be here shortly, so Angus shoved the thoughts away. 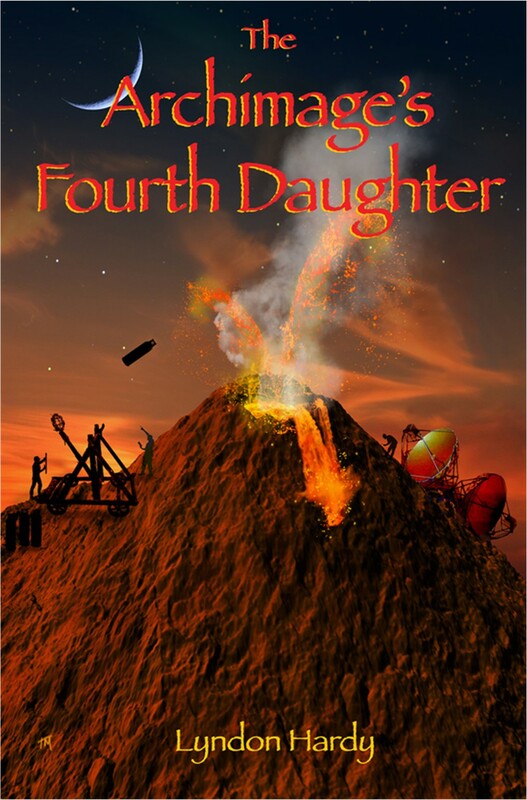 As always, Dinton would arrive first; Thaling would be the last to appear—the diplomat, his middle brother with the glib words to douse the rising anger boiling between Dinton and himself. Never venturing opinions of his own so they too could be attacked. His two, so unalike brothers. He wondered how much longer he could keep his secret from them. Without preamble, Dinton entered the alcove, breaking through Angus’ reverie. He was shorter but broader like an over ripe gourd. His hair also cascaded to his waist behind, but rather than the uniform dull brown of Angus, the roots showed silver. Even in the dimness, his eyes squinted nearly shut, as if he were afraid to let anything from the outside accost his senses. His fangs did not protrude. A long rod of polished wood hung from his waist on one side and a short dagger from the other. He carried a colored cardboard box in his hand. Angus glanced up at Dinton, but did not rise. His brother’s time as agreed upon absolute leader was almost over. Let him feel a little more aggravation before it was finished. Angus prided himself on how he carried himself in the caverns—back straight as a sheer cliff, untroubled by any threat unless directly challenged to a duel one-to-one. But every time he thought of the wasps, he could not help but wince. Thaling was the shortest of the three, hunched over like a rat trying to walk on only its hind legs. Long fangs protruding from his lips interfered with his speech, but his brothers had grown used to his slurs. As adults, they no longer jeered when he tried to mouth human words. For a few heartbeats, Angus and Dinton stared at each other. Like two feuding children, they played at who would resheath his weapon first. Finally, Angus sighed in exasperation and plunged his into its scabbard. Dinton waited a moment longer, smiled, and put his away as well. “If Dinton would only stop harping about being the oldest—” Angus began. “I do not cower to words that are merely loud,” Angus said as he brandished his stiletto as well. Thaling took a step backward and bared his own knife. “So this is the way of cowards? Rather than duel properly, instead, gang up two against one?” He showed his teeth, and a drool of foam began to drip from the side of his mouth. The three brothers stood facing one another in a tight circle, first threatening the one on the left and then the right. After a few dozen heartbeats, a gentle chime from the small clock on Angus’ table broke through the tension. Like the uncoiling of intertwined springs, all three men relaxed. “Yes, it is time to choose,” Thaling said, lowering his blade and resuming his usual slump. Dinton grunted. He stooped and began retrieving the box and its scattered contents. Thaling and Angus bent to help. Soon a flat board, the tokens, and the cards were in their proper places. “Before we begin, the oath,” Dinton said. Angus and Thaling nodded. “And regardless of who holds the baton, I shall practice no craft. But if I transgress, the tigerwasps shall do what they will with me.” Dinton then continued alone. “And regardless of who holds the baton, I shall practice no craft. But if I transgress, the tigerwasps shall do what they will with me,” Thaling repeated. “And regardless of who holds the baton, I shall practice no craft. But if I transgress, the tigerwasps shall do what they will with me.” Angus spoke as the last. Angus held his thoughts to himself. He pushed away the images of the wasp depositing an egg in his stomach bulges. There was high risk in what he was doing. He could not deny it. But then, neither could he continue with things as they were.